Katie Rood has been loaned from FA Women’s Super League club Bristol City to Lewes FC Women for the rest of the season. The 26-year-old New Zealander has an impressive track record as a consistent goal-scorer. In 2018 she was recruited to Bristol City from Italian giants Juventus. Rood or "Roodie" as she likes to be called, was born in September 1992 in Middlesbrough in England but emigrated to New Zealand when she was 3 and has dual nationality. She plays for the New Zealand National Squad and was selected for the Under-20s World Cup team that went to Japan in 2012. She is currently the highest goal scorer in the Kiwi equivalent of the FA Cup, the National Knockout Cup, having scored 37 goals in the competition. In 2012, Rood moved back to England to join the now defunct Lincoln Ladies FC. However, she was injured at the end of the season and the club subsequently folded. "Roodie" moved back to New Zealand in 2013, played for Glenfield Rovers and went to university to study Business Management. In 2014 she was named Player of the Year for her club team, Glenfield Rovers FC and was recalled for trials by the New Zealand National team. Two years later she won a place in the New Zealand Women’s Training squad for the Rio Olympics. In 2017, she was top goal-scorer for Glenfield and then became a member of the Football Ferns Development Programme. That same year, she signed for Juventus FC and in 2018, she was recruited by Bristol City. 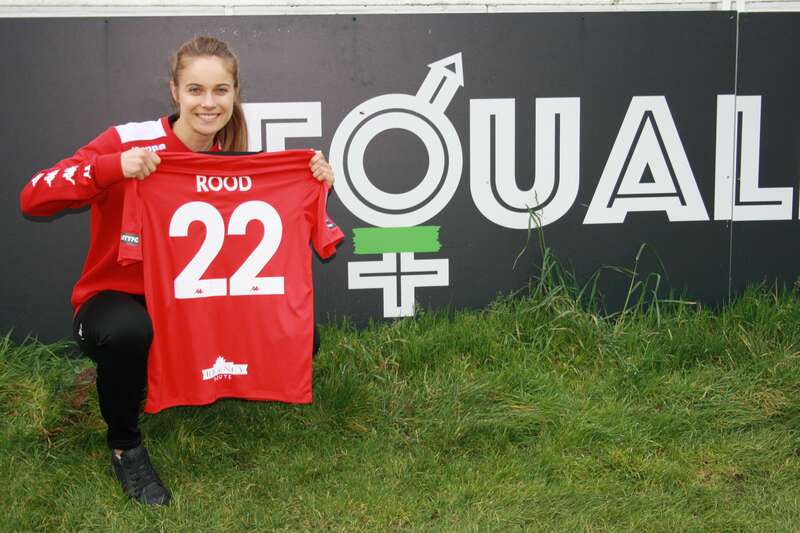 Rood’s career highlights were being in the under-20s World Cup squad in Japan 2012, making her debut in 2018 for the NZ National side, scoring and helping the team qualify for the 2019 World Cup in France, and signing the her contract with Juventus and winning the Championship. Manager Fran Alonso said he was really pleased to have signed Katie: “Katie is a very dynamic, talented and hard-working footballer who has joined us from WSL1 Bristol City and has previously played for Juventus. I am sure she will adapt quickly and fit in well with our team. Lewes fans can get very excited not only because we are able to attract top players to the Club, but because we will have the chance to see Katie, if she is selected, this June in the World Cup in France. How exciting is that!